Set up continues to change the Hangerdome from gym to concert venue. Photo courtesy of Greyson Scudder. After months of talks and contract negotiations, B.o.B. has confirmed his scheduled performance at Millsaps on Saturday, April 7, starting at 6:00 pm. This will be the first Millsaps-sponsored concert in nearly three years, although it was not an easy one to get: other performers were considered and then dropped, such as rapper Waka Flocka Flame, due to scheduling conflicts. However, Program Activities Council member and senior Evan Enochs said “We got the contract and resubmitted it, everything is signed and bound,” meaning that B.o.B. is committed to the event. 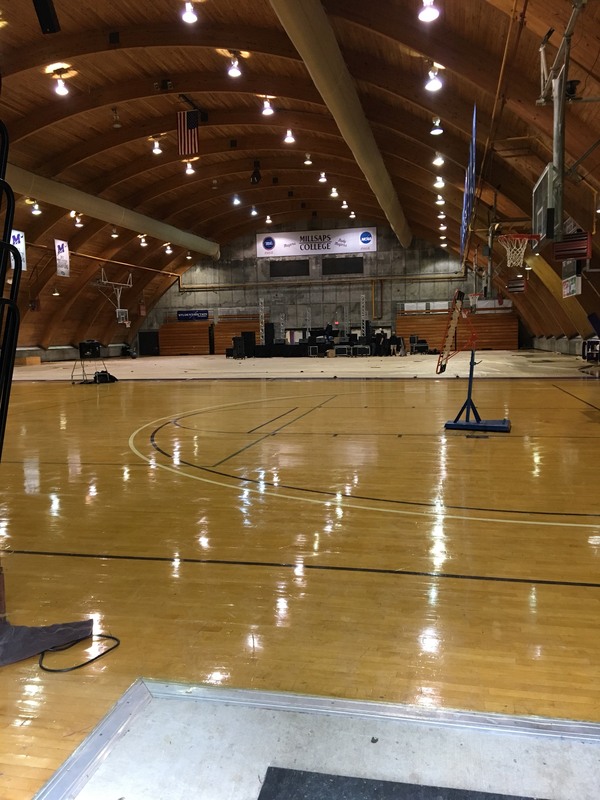 This concert will take place in the “Hangerdome,” the large gym in the lower HAC, a change from the typical use of Galloway Green, which has traditionally hosted many of the all-campus events hosted by Millsaps. This change in location serves many purposes, primarily preventing Millsaps from having to build two stages, as well as successfully avoiding the issue of inclement weather, Enochs said. Another issue that the use of the Hangerdome helps to allay is the problem of security. School administrators have raised concerns about incidents that occurred in previous years, primarily resulting from the participation of off-campus students in Millsaps events. An indoor concert allows for the door, and thus the influx of students, to be controlled. Other measures are being put in place by the PAC as well. “We will check student ID’s and students will get wristbands,” Enochs said. No one will be admitted in to the concert without a Millsaps ID, meaning that off-campus visitors, including prospective students, will not be allowed. This will prevent problems between off-campus visitors and Millsaps students. B.o.B. is famous for his collaborations, and has produced work with fellow rappers Lil Wayne and 2 Chainz, as well as Hayley Williams of Paramore. One of his best-known albums, “B.o.B. Presents: The Adventures of Bobby Ray,” which featured tracks like “Nothin’ On You,” “Magic,” and “Airplanes,” debuted at the U.S. Billboard Top 200 number one spot in May of 2010, according to Billboard. The rapper has 20 songs, several of which debuted in “B.o.B. Presents: The Adventures of Bobby Ray,” which made the Billboard Hot 100 as well. The concert will also feature an opening act by DJ Young Venom, his first performance at Millsaps College.